"Welcome to SilverSteed Motorcycle Adventures, an adventure touring company located in the beautiful Central American country of Costa Rica. Here at SilverSteed we ride because we believe God has made us to ride, to explore, to enjoy his creation. And so we go, we ride because it makes us come alive. So come ride with us and explore Costa Rica, one of the world’s most beautiful countries!" Covering the best that Costa Rica has to offer, this “Pure Life” tour takes you to every corner of the country through highlands and lowlands, visiting pristine beaches, majestic volcanoes and much more! We also offer a 7 day ($2,100/rider) and a 5 day ($1,375/rider) version of our Pura Vida Tour. Please contact us for more information. This tour highlights 7 of Costa Rica’s main volcanoes (although it has many more) with some beautiful mountain riding and a couple short hikes and one day at the beach. This “Two Seas” tour takes you through the mountains to some of the most beautiful beaches in the world where you’ll be able to put your feet in both the Pacific Ocean and Caribbean Sea. Both popular beach towns and off-the-beaten-path beaches are included with a day at the must see Arenal Volcano. We also offer several 3 day tour packages for those whose time is limited or may already be in Costa Rica for other reasons and only have a few days to ride with us. Please contact us for more info. We work hard to put together tours to give you an amazing adventure ride experience. However, our tours are flexible, we can customize the details of any tour to better suit your idea of an adventure tour whether it’s more time at the beach, in the mountains, or on the open road. We can work together with you to create a trip of a lifetime. We only set a few tour dates, allowing for those of you who can bring a group of friends to choose the dates that suit you the best. Las Americas Bridge over the Canal. Panamá City, Panamá. 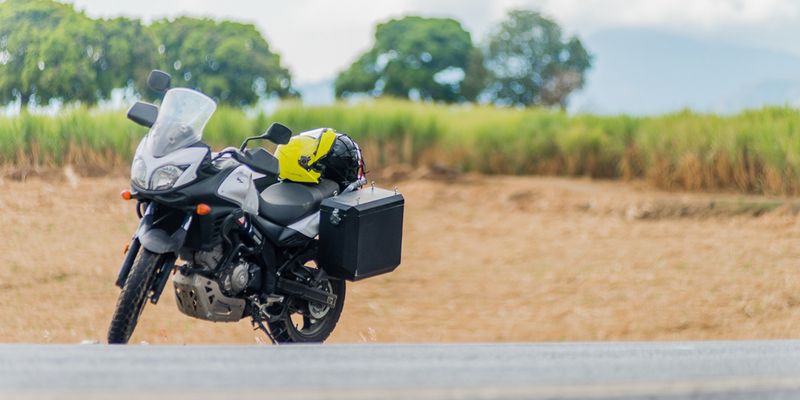 Volcanoes, islands, beaches, the Panama Canal, and more, this tour takes you all over Costa Rica and Panama for an amazing adventure riding experience. • What’s included: Bilingual Guide, Airport pickup/drop off, Hotels, Breakfasts, Lunches, Motorcycle rental, insurance, and fuel, Park entrance fees, Ferry passes and tolls. • What’s not included: Airline ticket, Dinners, Helmets/Riding gear, Extra activities (see below), and Airport exit tax. • Costa Rica also has much more to offer than great motorcycle riding such as white water rafting, zip-lining, canopy tours, bungee jumping, surfing (or surfing lessons), hiking, and coffee tours. Let us know if you would be interested in including any of these in your tour. Adventure has patiently waited for you.